Everything Changes – The Guide to Young Adult Cancer » Moving beyond cancer brain fog. Moving beyond cancer brain fog. I wrote an article for the New York Times about cancer and brain fog. It was really helpful to out myself as someone who is, at times, incredibly insecure about her mental and intellectual capacities post-cancer treatment. It blew me away to read the comments section and see that I was not alone in adjusting to post-cancer brain fog. Many cancer patients have confessed to me a desire to go back to school, but a fear that their scrambled brains cannot handle it. I get it. So I recently decided to risk fumbling through a college course in the privacy of my own home via a MOOC (massive open line course). I took a free online class called Introduction to the US Food System: Perspectives from Public Health. The class was offered by Johns Hopkins University through coursera. Propped up in bed at 11 pm, I geeked out on food growth and distribution graphs, and became curious about topics I had never thought of before: How does the growth of biofuel crops impact feeding the hungry? 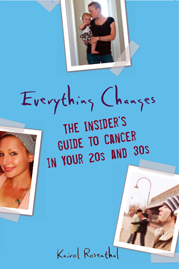 For more on chemo brain and cancer brain fog, check out Everything Changes: The Insider’s Guide to Cancer in Your 20s and 30s.